Bed And Breakfast2350 sq. ft. Many accolades for Gig Harbor's newest B & B! Awarded the best bed and breakfast business in Gig Harbor for 2015, 2016, and 2017. Selected for Gig Harbor's Garden Tour in 2017! Selected for Gig Harbor's Christmas Tour of Homes in 2013! PLEASE ASK MARY ABOUT AVAILABILITY. THE OTHER ROOM MAY BE AVAILABLE! The GROUP DISCOUNT RATE for BOTH PRIVATE bedrooms is $234 plus tax. Breakfast is not provided. There are 10 restaurants within two blocks and many more along the waterfront. Set in a flower garden setting, this vintage home built in 1901 was transformed in 2009 to a modern home with top end quality finishes. The charm of an older home is captured in the angles and high ceilings of the rooms. The rooms have small refrigerators, TV's, and DVD players. Guests can use all the living areas of the house, a living room, a family room, full kitchen, dining room, office, and 1.5 bathrooms. There is a shade pavilion on the patio and a large hot tub in the backyard. Bathrobes and hot tub towels are also available. The guest bedrooms, a sitting room, and office are located on the second floor. Choose the King bed room or the Queen bed room. The Queen room has a table and chair. We can add an 18' high blow up bed for a third person in the queen bed room. $15 more per night is charged for a third person. Everyone raves about the comfort of the beds. A microwave oven is provided in the sitting room, too. WI-FI is free. Need something to read? We have a community book exchange, too. Bathrobes, beach towels, hot tub, and comfort...we are THE PARSONAGE INN. Mary is a Tacoma native, where she grew up until meeting John at Western WA State College. They married after college and lived in several WA locations. The Souza's moved to Gig Harbor in 1992 and had 16 years in a successful real estate career before semi-retiring and starting The Parsonage Bed and Breakfast in August, 2010. Mary lost John with his passing in July, 2016. Mary provides a great breakfast between 9:00 and 10:00am. A gourmet breakfast is usually served. However, since competitive tennis is her first passion, she cannot guarantee a gourmet breakfast. However, be assured you will have a wonderful stay at The Parsonage! We are right downtown and only 1.5 blocks to Gig Harbor Bay, restaurants, shops and more! Our house was the first minister's residence in Gig Harbor. The home was built by volunteers over a 4 year period, and was finally finished by Brother Andrew Jackson McNemee at his own expense, becoming its first occupant. Being only the fourth owners, husband John was able to gather significant historical data about the home, the first church of Gig Harbor that set next to it, and the growth of the community. Several binders of historical information, photos, reconstruction, original house materials, and previous owner interviews are available to visitors. There is no place on earth as gorgeous as Gig Harbor on a sunny day! To the east stands Mt. Rainier tall and majestic with the Cascade Mountains at its feet and Gig Harbor Bay in the foreground. To the west are the Olympic Mountains as a gorgeous backdrop to the villages a short drive from here. Eagles soar in our skies, an array of bird varieties are attracted to the yard and bunnies scamper about. Having designed the home to meet all their needs and giving Mary her kitchen 'to die for', and with all the nooks and angles of a traditional Victorian home, Mary doesn't plan to sell any time soon. The totally rebuilt Parsonage now at 2350 square feet is a home she wants to share and enjoy with others. toilet, Daily cleaning for non-family groups. toilet, combination tub/shower, Guests share tub/shower. Daily cleaning for non-family grp. Catch a trolley car that goes past The Parsonage! It runs from late spring through September. Gig Harbor has a village atmosphere along the waterfront of Gig Harbor Bay. Quaint shops, artist studios, restaurants and marinas line the bay. Big box stores are located nearby. 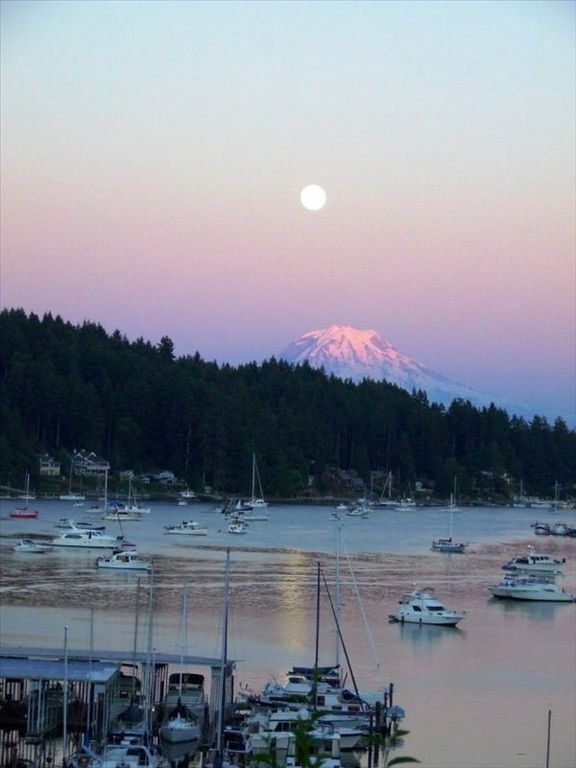 See Gig Harbor Bay, Mt. Rainier and boat marinas from the property. Terrific Mount Rainier view from the property. Gig Harbor Bay can be seen from the property. The house stays cool in the summer. However, we have air conditioners in the bedrooms. We change guest bedding once a week and clean guest rooms once a week, or as needed. Guests are welcome to use the full size washer and dryer with our products in the laundry room. We have off street parking for several cars. Available for golf clubs and bicycles. We launder guest towels every few days. Guests may select their towels. The YMCA is one mile away and they offer inexpensive drop in use. Large curved sectional and one chair with ottoman. Yes and it is very quiet. Each room has a small refrigerator. We have a 2nd full size fridge in the attached garage, too. One is located in the upstairs sitting room in addition to the one in the kitchen. Yes, one for caffeine and one for decaf. Guests are welcome to use kitchen ware. The TV's in guest rooms feature Netflix. The living room and family rooms have cable channels, Netflix and Amazon Prime. All TV's also have DVD players. We have an exchange library. We have a few games, such as Pictionary, Clue, Cranium, Perfect Sense. We generally will offer music through Pandora or a TV station. We have a few games and toys and children's books. Rent a kayak or stand up board only a couple blocks from The Parsonage. Take a boat tour or rent one yourself in Gig Harbor Bay. We have some life jackets available. It is easiest to rent your gear at the slopes. Snoqualmie Summit is about 1.5 hours away. It offers many wonderful runs from chairlifts that seat 2-4 people. There are restaurants at the summit. There are community and school courts available. One of our guests even joined Mary's tennis group! There are more courses to play than your vacation will allow! Fits 8 people and features one side as a lounger with jets for legs and feet and back. Peace and quiet, no freeway noise, no banging doors, well insulated bedrooms and bathrooms, coffee and tea available all day. Mary was warm and welcoming. The house was very clean and comfortable. Much better than staying in a hotel. It was nice to have the hot tub to ourselves- very relaxing. Love the historical aspect of this house. We will definitely book here again. And walking distance to most everything on the harbor. Homely and comfortable; welcoming and friendly. Great hospitality the Parsonage Inn is centrally located and within easy walking distance of the centre of Gig Harbor. The accommodation is extremely clean and tidy. Would highly recommend. Great stay. Really nice accommodations both inside and outside. Mary was a wonderful host. Definitely a repeat. We are very centrally located for visits to Seattle, Wild Waves Amusement Park and Water Slides in Federal Way, The Lemay American Car Museum in Tacoma, Northwest Trek Wildlife Park in Eatonville, The Nisqually National Wildlife Refuge just south of Dupont, and Pt. Defiance Park and Zoo in Tacoma, just to name a few. We've had guests arrive and remove their bicycles from their cars and off they go. There are both paved and dirt paths through the woods. Some guests like to rent a car at the Airport. Others prefer to take a shuttle bus from the airport to Gig Harbor, where we pick them up. Cars can be rented in Gig Harbor, too. You may not want a rental car during your entire stay, if you enjoy walking. Buses go into Tacoma and we are close to a bus center. Golfers always have a terrific time here. Besides the two Gig Harbor courses, there is Gold Mountain Golf Course 18.5 miles away, McCormick Woods 16 miles, Kitsap Golf and Country Club 24 miles, Horseshoe Lake Golf Course 7.5 miles, and Village Greens Golf Course 16 miles. We haven't even started to name those in Tacoma, which may be even closer. The U.S. Golf Open will be held at Chambers Creek Golf Club in June, 2015! That course is only 12 miles from here. We are 12 minutes to the shuttle site, where attendees will park. The shuttle ride is only another ten minutes to the course. Boat rentals, paddle boards, stand up boards, and kayak rentals, fly fishing lessons and harbor tours can all be enjoyed within 10-15 minutes walk from The Parsonage. Relax at downtown parks or Gig Harbor Bay viewing tables to catch herons and harbor seals at play. A gentle walk takes you to local stage productions. Not to be forgotten are the free Tuesday evening open air concerts within walking distance during the summer. We will supply your blanket or portable chair. Another laid back community event are the free 'walk in' outdoor movies on Friday evenings during the summer. Enjoy Washington's forests on miles of paved and unpaved walking trails through the woods. Gig Harbor also offers quaint downtown shops within walking distance and full sized department and grocery stores within a couple miles. Come and visit us! You will love the spectacular beauty of our mountains, trees, Puget Sound water ways and lakes. Visa, Mastercharge, American Express, Discover, Debit Cards, Paypal, or personal check via mail. CHECK-IN AFTER 3:30 PM AND CHECK-OUT BY 11:00 AM.